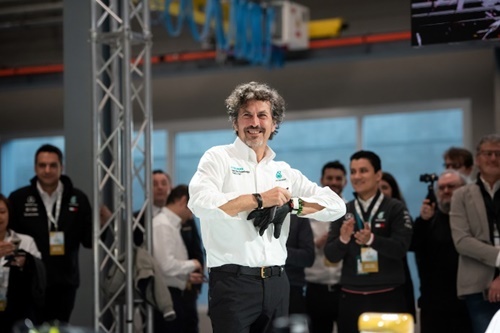 Turin, Italy, 22 February 2019 - PETRONAS Lubricants International (PLI) today unveiled a new range of PETRONAS Syntium with °CoolTech™, bringing the latest ‘track-to-road technology’ in the most advanced engine lubricants to-date. The series includes the first engine oil for hybrid cars, marking PLI’s entry into the hybrid car market. Aside from five new upgrades in the PETRONAS Syntium 7000 range, enhancements were also made to the PETRONAS Syntium 3000, PETRONAS Syntium 800 and PETRONAS Syntium 500 series to provide better engine performance and lower carbon emissions from motor vehicles. PETRONAS Syntium with °CoolTech™ technology is formulated with strong oil chains to defend against excessive engine-damaging heat for a trouble-free drive. With the advancement of this formula, the engine’s vital components are protected, power output is maximised, fuel efficiency is optimised, keeping engines cool so that drivers, too, can keep their cool. “Much like human beings, engines exposed to strenuous conditions need to be kept cool in order to ensure optimum performance. 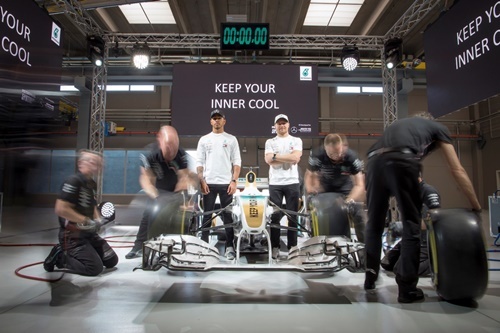 PETRONAS’ fluid technology is designed to perform under pressure, as proven by the outstanding success of Mercedes-AMG PETRONAS Motorsport in the FIA Formula One™ World Constructors’ Championship over the last five years. Today, we are pleased to bring to our consumers, fluids created with our winning technology,” said PLI Managing Director and Group Chief Executive Officer Giuseppe D’Arrigo. 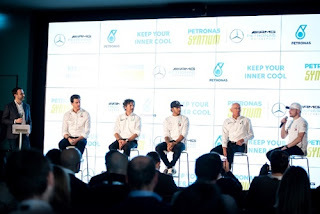 The lubricants were showcased for the very first time at the PETRONAS Global Research and Technology Centre, here, in the presence of five-time World Constructors’ Champions, Mercedes-AMG PETRONAS Motorsport’s Formula One Drivers Lewis Hamilton and Valtteri Bottas, as well as the team’s Team Principal Toto Wolff. “Technology is the core driver of our business and sets us apart from others in the industry. We are proud to present the new range of PETRONAS Syntium with °CoolTech™, including the new PETRONAS Syntium 7000 Ultimate Series. The introduction of a new oil for hybrid engines, also marks our entry into the hybrid car market, a result of our technological strengths and our commitment to create fluids that help reduce CO2 emissions,” D’Arrigo added. 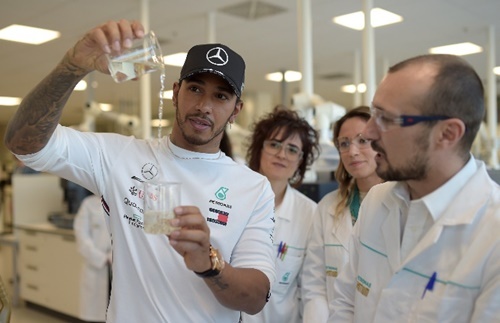 One of three fluids that make up PETRONAS Fluid Technology Solutions™, PETRONAS Syntium, together with PETRONAS Primax fuel and PETRONAS Tutela gearbox fluids have pushed the Mercedes-AMG PETRONAS Motorsport to five consecutive Formula 1 wins in the Constructors and Drivers Championships since the start of the Formula One hybrid era in 2014. After a successful 2018, during which PLI pledged to dedicate 75% of its research and technology investments in projects to lower CO2 emissions, the Company is looking forward to more opportunities to apply its technology in co-engineering fluids in this direction. The new PETRONAS Syntium range is also supported by a broadened communications approach that includes real-life accounts of people rising above high-pressure situations as a result of keeping their inner cool. The new range of PETRONAS Syntium 7000 lubricants will be made available globally, in phases from Q2 2019. PETRONAS Lubricants International (PLI) is the global lubricants manufacturing and marketing arm of PETRONAS, the national oil corporation of Malaysia. Established in 2008, PETRONAS Lubricants International manufactures and markets a full range of high-quality automotive and industrial lubricants products in over 90 markets globally. Headquartered in Kuala Lumpur, PLI has over 30 marketing offices in 27 countries, managed through regional offices in Kuala Lumpur, Turin, Belo Horizonte, Chicago and Durban. อัพเดทล่าสุด : 9 มี.ค. 2562 10:30:48 น.